GoutResolve Review – Scam or the Real Deal? 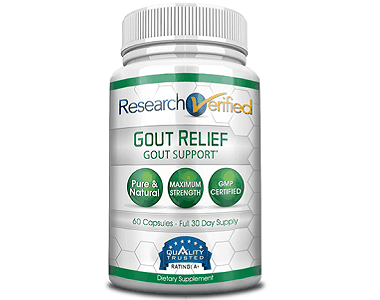 Today we review GoutResolve as made by Gout Specialists (the name of the manufacturer). They promise that their natural enzyme and flavanoid formula is a 360-degree, ‘total care’ gout solution. It has been made to reduce uric acid levels – the main culprit causing the needle-like, immobilizing gout joint symptoms. Not only is uric acid kept in a healthy range, says Gout Specialists, it is also prevented from building up again. In addition, the formula supports healthy liver and kidney function, which need to be optimal in order to flush out uric acid excess in the urine. Uric acid build up is down to the purines found in protein-rich foods, and also genetics. Bromelain – Bromelain is a protease from the stem of pineapples which breaks down proteins. Quercetin – Quercetin can help with inflammation in the body. It is especially effective with Bromelain. Artichoke Leaf Extract – Helps promote a healthy functioning liver and a healthy digestive system. Celery Seed Powder – May help kidney function. Turmeric Root – A potent anti-inflammatory, widely believed to have many health benefits. Ginger – A chemical in Ginger, called 6-shogaol, is thought to stem inflammation and pain. Milk Thistle (Silybin) – Milk Thistle cleanses and detoxifies the body. Alpha Lipoic Acid – Alpha Lipoic Acid may help to promote healthy liver function. The liver needs to be healthy and functioning properly to filter Uric Acid from the blood. Dandelion Root – Contains quercetin, luteolin and inulin which help liver function. B6 (Pyridoxine) – B6 helps with the production of antibodies. Burdock Root – Help cleanses the blood. Proprietary Blend – Skullcap, passion flower and chamomile to soothe and fight inflammation. Folic Acid – Appears to lower uric acid levels. B6 – A water-soluble vitamin that helps break down uric acid. 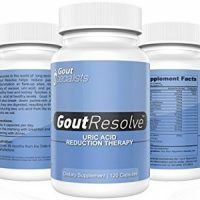 How do you use Gout Resolve? Strangely, exact usage instructions are not available nor are the number of capsules per bottle disclosed. You need to use one bottle per month and on an ongoing basis for a chronic defeat of gout. You will see relief in anything from 2 days to 2 weeks, depending on how much uric acid build up is in your body. It is natural and safe but always consult your doctor especially if pregnant. You can only buy this supplement on the Gout Resolve website. One bottle costs $57, 3 bottles cost $111, and if you opt for the free 2-week supply you can purchase your first month’s bottle for $30. The cost is comparatively high compared to other supplements although this formula is thorough. A 60-day moneyback guarantee exists but it isn’t clear if you can return used as well as unopened bottles. The number of quality ingredients used is one of the most impressive formula lists, and they also synthesize well. We do believe this is a multi-angle approach remedy that does well to provide enhanced liver and kidney function, as well as a combination of enzymes and flavanoids to break down purines. 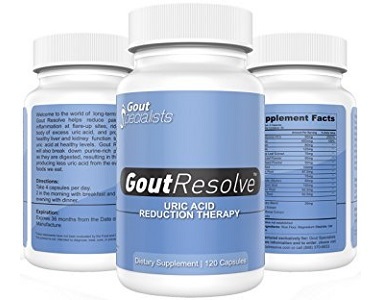 Unlike other manufacturers, they do no appear to be exaggerating claims in the sense that there is no talk of being reckless with your gout diet but using a supplement to remedy it. You must watch your purine intake and over time, this supplement will in all probability increase your ability to absorb it thanks to how much uric acid has been flushed out. This is a long-term solution. It should work well initially but ‘permanent’ results come with long-term use. That said, it is expensive – more than double of one or two other supplements we’ve seen that are also comprehensively formulated.